In 2015 more than 45000 unaccompanied minors sought asylum in the Nordic countries. This map shows the number of the unaccompanied minors on municipal level. The distribution of unaccompanied minors differs between the Nordic countries. 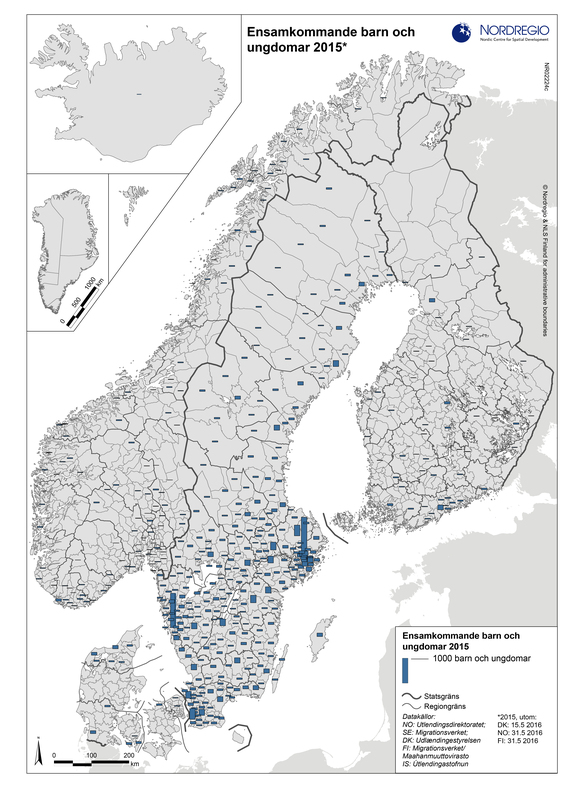 In Sweden an agreement to receive unaccompanied minors signed by all the municipalities has resulted in them being distributed over the whole country. In Norway, Denmark and Finland unaccompanied minors are directed to accommodation centres resulting in higher concentrations in certain municipalities based on the location of these centres. Absolute numbers of unaccompanied minors arriving in the country were also substantially higher in Sweden. The municipality that received the most unaccompanied minors during 2015 was Stockholm (around 2200) followed by Gothenburg (1700), and Malmö and Uppsala (both around 500). In Finland, the municipalities that received most unaccompanied minors were Espoo (more than 200) and Oulu (more than 150); in Denmark in was Jammerbugt, Tønder and Thisted (all around 150); and in Norway Farsund (above 100), Fauske and Bodø (under 100).